LIFE, LOVE, AND LUST IN ROME: FROM THE APPIAN WAY TO WISTERIA LANE by Vicki Wine Embers of the Ancient Flame provides excerpts from the love poetry of Catullus, Horace, and Ovid for students who are ready to read Latin with the help of vocabulary, notes, and commentary and especially for those in a class preparing for the International Baccalaureate Examination. This volume, in its second edition, introduces selections of Latin poetry attractively laid out with vocabulary and notes facing the text. It presents the poetry as a means of appreciating the beauty of literature, while also learning about life. The last paragraph of the note to the students sets them on their way: “As you read the works of Catullus, Horace and Ovid, examine them not as a grand translation puzzle awaiting a solution, but as literature, unrolling the centuries-old stories of deception, love, fear, hate, innocence, lust, honor, betrayal, and beauty. This was Rome!” The preface to the text, the introductory “Note to the Student,” the introductory biographical data for each of the poets, and the introductory material for each of the individual poems all contribute to viewing the poems as a “window” into daily life. This commentary guides the students to see both the parallel to modern life and the historical context of the poets, who were influenced by and interacted with these events. The introduction to the appendix, describing poetic meters, comments on the emotion of lyric poetry and the bond between poet and audience. 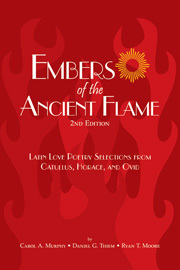 It further points out, “The purpose of this small text is not to instruct in the fine points of Latin meter, but rather to present the works of three of the greatest poets in the Latin language for students of moderate experience in the reading of Latin.” (83) This edition presents sufficient help for students reading Latin at the intermediate level. The notes cover vocabulary, grammar, and context. The abbreviated glossary covers only select vocabulary to encourage students to read without looking up every word and to take advantage of a dictionary—the goal is to develop their ability to understand and appreciate sight passages. The Suggested Readings and Bibliography provide excellent resources the teacher can encourage the student to explore to further enlarge the context of the poetry or for in-class reports. In addition to this supportive material, the book includes other features: ? Photographs of ancient art by Fr. Raymond V. Schoder, S.J. accompanying each chapter ? Two maps (Italy, the Mediterranean) ? An appendix covering poetry and poetic meter ? A second appendix listing rhetorical/literary figures These features give teachers in the classroom a nice array of supplementary materials. All of the features contribute toward providing the student with an appreciation of literature and an understanding of Roman life.